All aboard the high-speed passenger train! 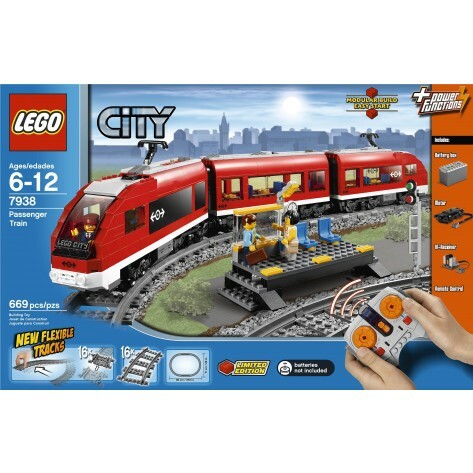 The LEGO City Passenger Train is a three-car LEGO train set, designed for children ages 6 to 12. It is not recommended for younger children because the set includes small pieces, which may present a choking hazard. Children might need help assembling the nearly 700 LEGOs that come with this set. The LEGO City Passenger Train comes with 32 flexible, connecting track pieces, with 16 curved pieces and 16 straight. This LEGO train set is remote controlled, and the eight-channel remote control has seven different speeds. The controller requires three AAA batteries, which do not come with the set. Among the LEGOs that come with the set are three mini-figures, a two-seat waiting area, and three train cars (two locomotives and one passenger car). All of the train cars in the LEGO City Passenger Train set feature removable roofs so that the mini-figures can be placed inside. Other items that come with this set include an IR receiver and a motor.